Last week saw the final round of the Global Rallycross Championship at the Special Equipment Market Association (a.k.a. SEMA) show in Las Vegas. This time the track was set up in a large parking area just outside the convention center. It still had the big gap jump, but this time it was properly made of dirt instead of the death steel of the other rounds. 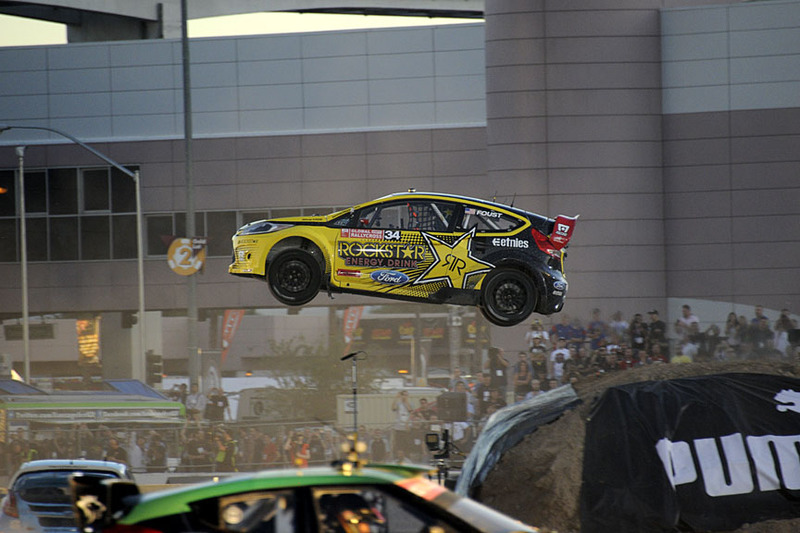 As was expected, Tanner Foust took the win in the final heat but that was only after a very close battle with Ken Block. This was probably the closest GRC race yet between two skilled drivers. Ken got a great start and kept the lead for much of the race with Tanner following close behind. Tanner’s ERC experience showed when Ken then got just a little loose on the dusty tarmac and Foust ducked underneath him in what was a very small gap, but still made it a nice clean pass. Ken had 2nd place in the bag, but a lap after being passed he suddenly pulled off with his car smoking and on fire. There was a red flag for safety reasons and causing a restart and a 4 lap sprint to the finish. Foust not only won the event, but also wrapped up the championship as well. 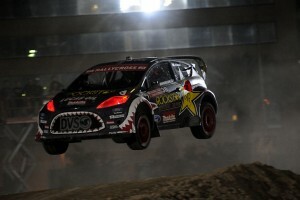 So what have we learned from Global RallyCross 2012? First of all, I think we learned that compact four cylinder turbo cars pushing out 600+ horsepower can be very exciting. Unfortunately, we also found out that these tightly wound machines are fragile. The number of broken drive shafts and gearboxes was frequent and frustrating, leaving the few well tested cars dominating and others pulling off the course. Second, I think we learned that smaller is better when it comes to the cars. It will take a long time for anyone to beat the tiny, lightweight OMSE Ford Fiestas developed by Andreas Eriksson’s custom shop in Sweden. All season the only cars competitive with the Fords were Citroen’s DS3 that Sebastian Loeb used to dominate X-Games, and the Dodge Dart piloted by Travis Pastrana. There is a reason why Pastrana was able to keep up as his larger Dodge Dart. The GRC Dart was also developed and built by Eriksson’s custom shop in Sweden, just as the Fords. Ford not only allowed Andreas to help Dodge, but actually endorsed the idea. Ford has put a lot of investment into GRC and wanted to see good competition with other American manufacturers to help the sport grow in popularity. As the season came to a close, Hyundai and Subaru eventually showed more speed and were getting closer although they still have a ways to go. Unfortunately for the GRC, Hyundai dropped its contract with Rhys Millen and the Veloster likely won’t return next year. Finally I think we learned that that dirt rules. The first couple of rounds on full tarmac were down right boring as the cars with the best acceleration always won, which were of course the Fords. By far the best and closest races had dirt and lots of it. The slippery dirt is the great equalizer in performance between the larger heavier cars and the nimble little Fiestas. 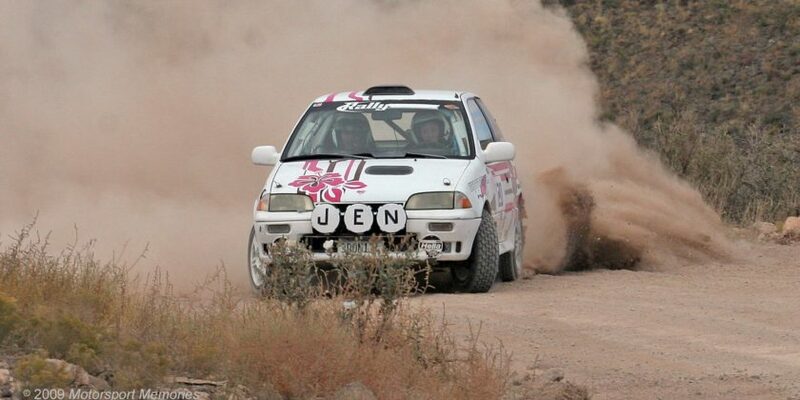 I think the dirt makes for more challenging driving, and more excitement for the spectators. I think Global Rallycross Championhsip will increase its popularity as it grows into a larger season next year. It will also truly become global as GRC events are expected at the now X-Games “World” events in Europe and Brazil. I do think that there needs to be some serious changes to make it a truly exciting championship though. Here are my thoughts on what they did wrong and what they can fix. ESPN2 needs to fix their programming coverage. The commentary was sometimes very annoying as the announcers didn’t seem to even know much about the sport. 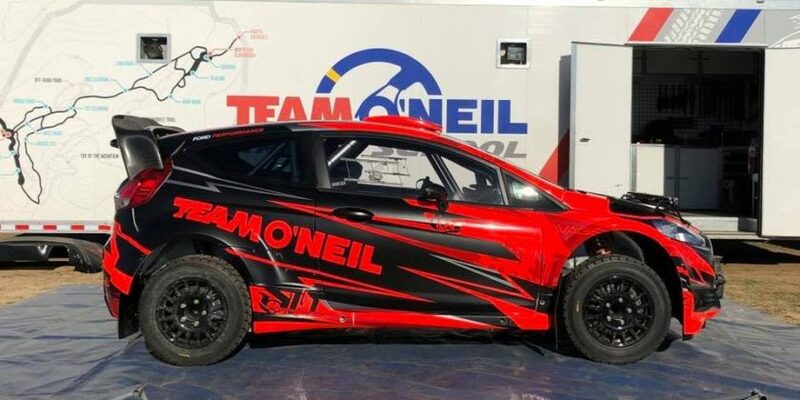 At least have them watch some tapes of the European Rally Cross series and give them some driver backgrounds before putting them in front of the cameras to cover GRC. I was also very much annoyed to have what was a pre-recorded show go over its allotted time slot, and this happened multiple times. This is simply ridiculous. One episode I tried to record on my DVR started late because they decided to put the race right after a WNBA game that ended up finishing late. This cut off half the event as it ran into the next show’s time slot. This is pre-recorded, so they know how much time it is going to take. Be smart and give the start time a 30 minute gap from any program that might run over, and throw a 30 minute informercial after it so DVR watchers don’t have to record a one hour or two hour show after it. Okay, yeah they would like to have people watch it live…but seriously the target audience they are going for isn’t going to be home at 8PM on a Saturday night to watch it. They need to get the rules straightened out. It seemed, especially at the start of the season, that rules were made up as they were going along. Okay, yeah they are still learning, but their were too many restarts, a lack of driver penalties, and just general confusion to the point that the commentators didn’t even know what was going on at times. The cars need to become more equally competitive. The gap between the Erikkson prepared cars and the rest of the field was almost sad. To even things out, bring in more dirt! Dump the jump. Okay, yeah the jump is cool for that photo shoot you want to do with the one car going over the jump and the other cars going under. We’ve seen it now, but it isn’t necessary to get our attention. I think the gap jump is a key reason why so many cars had mechanical issues as the constant hard landings just beat the cars to death. Keep the smaller “yumps” , but get rid of the big steel monster. If you want everyone to see your new sport, make it available online and not just via the stupidly restricted “WatchESPN” service. IndyCar was smart to put full races in HD quality on YouTube and GRC should do the same. I have high hopes that Global Rallycross Championship will improve and become an exciting series with a strong following. The organizes just need to polish things up a bit.